Sometimes employees are subjected to excessive workload due to poor planning by managers. 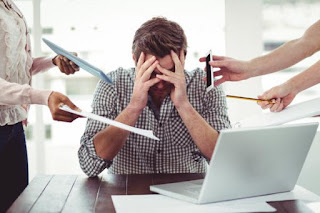 The tight deadlines and the duty to complete tasks against time increase the levels of cortisol in the worker ( hormone that causes stress ), which can increase his anxiety, making him irritable and diminishing his ability to solve problems and perform the tasks. Other times the cause of work stress is precisely the lack of stimulation and monotony in the job . Excessively repetitive work, which does not change over time, can give the worker a sense of emptiness and rejection when he is obliged to repeat the same task day after day, so that each new day will be seen as a long and heavy succession of Hours that never ends. Fear of losing the job is another cause of job stress . This fear can cause the employee to be in a continuous state of stress. In addition, this situation is often combined with an inadequate remuneration, so that the fear of being fired or replaced is linked to the economic stress caused by very tight income, which can hardly cope with household expenses . The possibility that a small mistake has serious consequences is another cause of work stress . An air traffic controller or surgeon in full operation are good examples that illustrate this trigger. The worker is forced to maintain absolute concentration for a long period of time , where the shortest distraction can have fatal consequences. Another cause is the continued exposure to tasks that are hazardous to the health or physical integrity of the employee. Being exposed to this type of situation forces our body to be continuously alert , with high levels of cortisol in the blood, which in the medium and long term is harmful to health (see symptoms and consequences of work stress). At times, work stress may be caused by the lack of support the employee receives from both his subordinates, his superiors, and even his own peers. In this category we would find an employee who receives few or almost no guidelines on a certain task that they have been assigned to perform. A team leader who tries to coordinate his subordinates to perform a certain task and does not get the necessary support or involvement on his part. Or an employee who requests support from his colleagues to resolve some type of doubt and obtains a negative response. Such situations can cause a great deal of stress , since the subject, in addition to feeling frustrated and powerless, feels despised by their surroundings. If in the previous point the worker was deprived of the support necessary to perform his tasks satisfactorily, in this case he goes further and is not only deprived of support, but is also the object of ridicule, insults, intimidation, threats and even Physical violence (what is known as "mobbing" ). It is one of the most serious cases of work stress in which in many cases employees require psychological attention. A mismanaged the ability to control by those who hold positions of power in the distribution of tasks and decision-making can be another cause of work stress. The way a superior relates to his subordinates is one of the keys to productivity and competitiveness . Yet, even today, there are still individuals who prefer shouting or treating their employees as slaves, rather than launching more productive types of leadership. The lack of positive stimuli towards the worker when he obtains a beneficial profit for the company, can be among the causes that produce work stress . This type of stimulus does not necessarily have to be in the form of economic gratification, in many cases a simple congratulation by the boss for the results obtained can make the employee feel valued and increase his motivation instead of making him feel that his work Is despised or ignored. Within this point would also find those cases in which the possibility of labor promotion is scarce or null. Another of the causes of work stress can be an inadequate management of the basic resources that the worker needs to feel comfortable in his job , such as temperature, light or sometimes silence, which may be contaminated with noises Unpleasant, which prevent the employee from concentrating properly when needed. In general, the causes of work-related stress are not limited to a single factor, but are the result of a combination of several, which aggravates the problem . On the other hand, not all people react in the same way to the stimuli that generate stress, so that situations that could generate great levels of stress in one person, could cause very reduced levels of stress in another or even almost null. Therefore, it is important to assess the situation and analyze the causes of work-related stress before taking action . To combat bad stress, just focus on the positive aspects of your working day, even the smallest, to improve your mood. 2 "Throw on paper" your anxiety by writing your thoughts. If you feel overwhelmed, drawing up a list of tasks will help you overcome your stress. 3 Make a call at home: talk to someone you love to boost your level of oxytocin, the hormone of well-being. 4 Listen to music in your office. Melodies are a distraction that reduces muscle tension and secretion of stress hormone Cortisol. Research has shown that listening to Mozart can help improve communication skills, creativity and work ability. 5 Switch your usual espresso against a glass of milk that will increase your serotonin level, the hormone of well-being, and fight your blues. 6 Stay in the office for as long as necessary to complete all the pending files. People who take home work are 20 times more likely to suffer from stress. 7 Put your office in order to put your mind in order. Working in an open environment helps to free the mind from unnecessary distractions and thus, to improve productivity. 8 Count up to 10 in a foreign language . This distracts the mind fairly quickly and effectively to combat the sudden surges of stress. 9 If you feel you are about to explode, stand up and stretch for 15 minutes. It is proven that this exercise helps to regain its composure. 10 Play a game. Video games can reduce stress and restore morale. Obviously, everything depends on the game chosen: from the perspective of relaxing, golf, majong or solitaire are much better choices than Call of Duty.